Harry A. Sawyer, 81, born Dec. 2, 1936, was called to his heavenly home on Oct. 22, 2018. His belief in our Lord and the devotion of family supported him in his struggle which ultimately gave him peace. 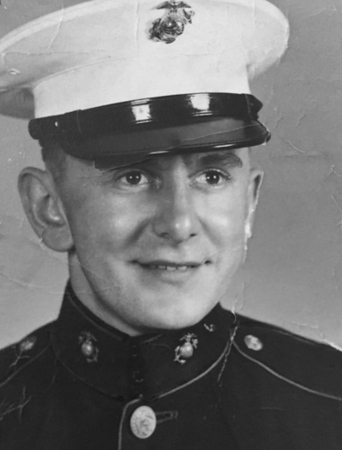 Harry was a proud Marine and served his country that he loved so dearly during the Korean Conflict. Prior to his retirement, he was employed by Cushman Industries Hartford, Conn. He was an avid bowler, enjoyed fishing, flea markets and spending time with his best friend, Fred Maltese. He was a former member of The Connecticut Western Dance Association. His greatest love of all was his family. He will be fondly remembered for his great sense of humor and for those of us that truly knew him, his hilarious stories that were always very long winded and extremely detailed. He was kind, compassionate, funny, loving and selfless. Harry will be incredibly missed by his loving niece and nephew, Dee and Joe Faraone, with whom he spent countless hours with in their home creating beautiful memories together. Harry was predeceased by his parents, Cecil and Olive Sawyer of Harmony, Maine, his sister Dolores, his brothers, Lee and Royal, and niece, Jacqueline. Harry is survived by his former wife, Jenny Sawyer of Granby, Conn., with whom he remained friends and always had a special place in his heart; his sons, Rick and wife, Stephanie of Arizona, Tom and Harry Jr. of Granby; grandsons, Kellan, Kyle and Austin; along with several nieces and nephews. He loved you all unconditionally. A special thank you to the staff of Autumn Lake Healthcare for the wonderful care he received, especially Amarilis and Gloria, who showed him respect and compassion and appreciated his humor. You were immensely loved and will be deeply missed by all. Til we meet again...Salute! A graveside ceremony will be held Monday, Oct. 29, 2018, at 1 p.m., State Veterans Cemetery, 317 Bow Lane, Middletown, Conn.
Posted in New Britain Herald, on Friday, 26 October 2018 19:06. Updated: Friday, 26 October 2018 19:08.